Video has emerged of Beyoncé and JAY-Z‘s backing dancers tackling a stage invader who rushed the couple during a performance in Atlanta on Saturday night. 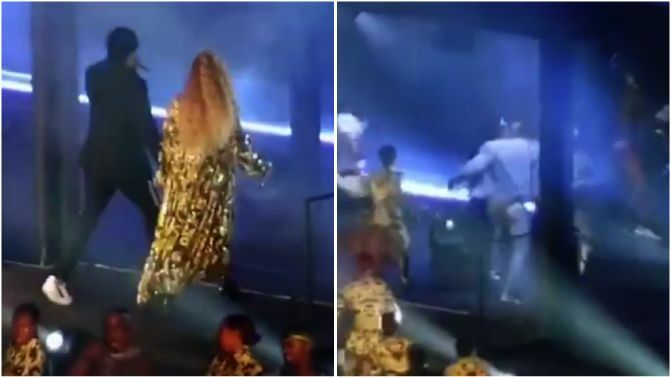 The culprit, who has since been identified as 26-year-old Anthony Charles Thomas Maxwell, is seen jumping onto the stage during the ‘On The Run II’ show, as Beyoncé and JAY-Z exit towards the rear of the stage. Maxwell is intercepted by a group of backing dancers and detained by security, after reportedly making brief contact with JAY-Z. Maxwell was reportedly cited for disorderly conduct following the incident, but was not taken to jail. Watch video of the moment, below. There were reports Beyoncé and JAY-Z would bring their ‘On The Run II’ tour to Australia later this year, but with dates yet to be announced, it seems it might not actually happen until 2019 (if a deal has actually been made).